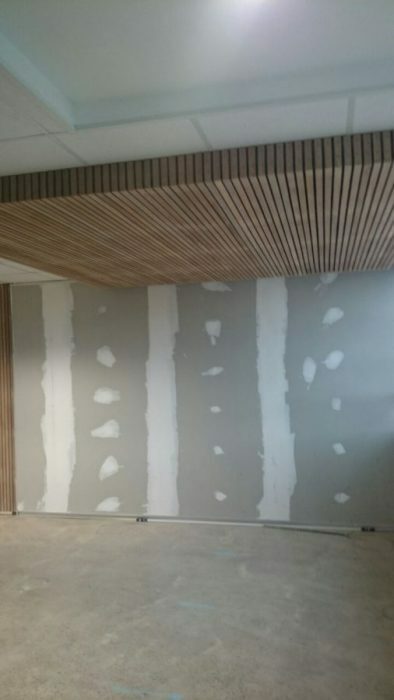 Here’s some balau cladding work we did on the ceiling in the reception of a new office building in Umhlanga Rocks. 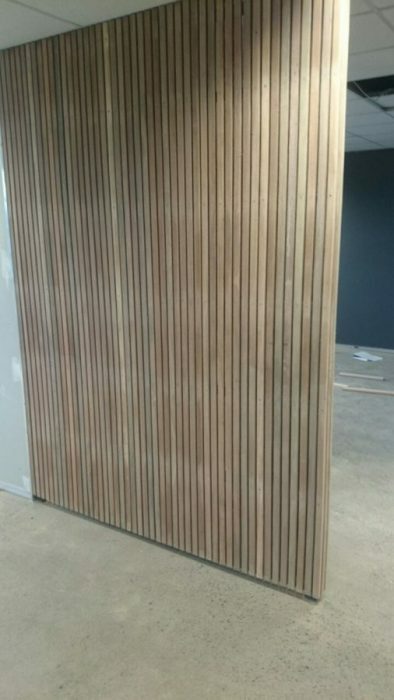 We used 19 x 30mm strips of balau which we ripped from a standard 19 x 68mm balau deck board. 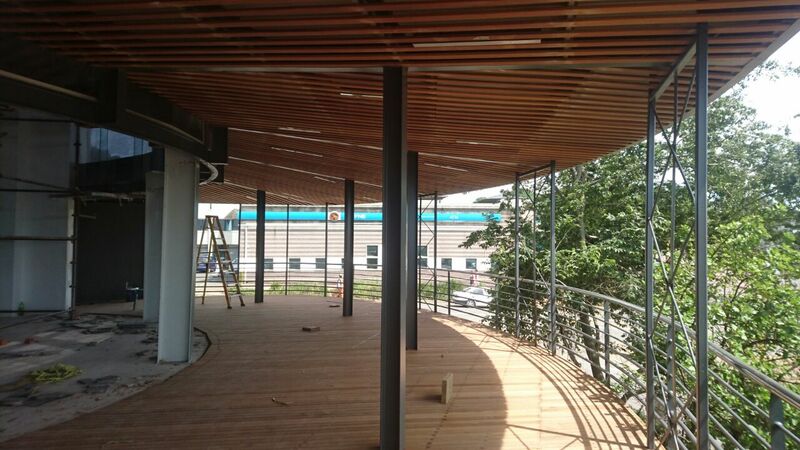 We started off with a treated pine frame or structure on to which we attached these balau strips. Being a ceiling it was important to ensure that our structure didn’t fail under the weight of the balau. 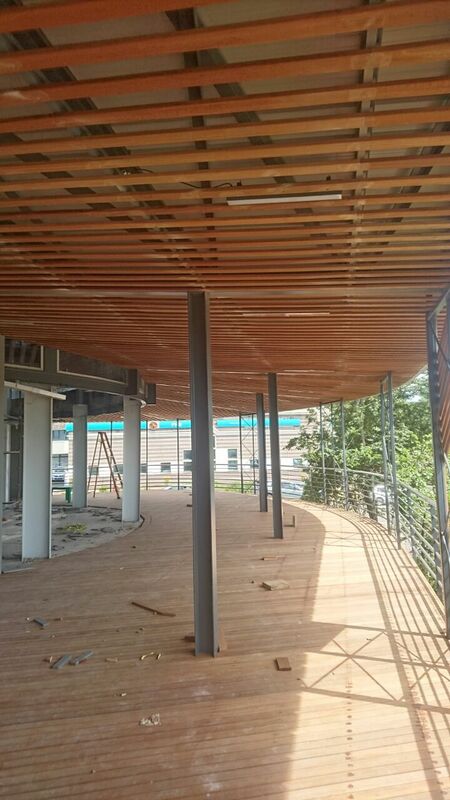 Balau, being a very heavy and dense wood, can get quite heavy when suspended from a ceiling. Secure fixing points, and enough of them, are necessary to ensure it doesn’t fail. It was very important to do this as neatly as possible as it is the reception area and as such is visible to all visitors as they enter the door. Care needs to be taken to ensure that gaps between boards are uniform and that the boards are parallel to each other. Also it is important to get the total structure to line up parallel with walls and corner of walls and slab above. It becomes unsightly when these don’t. At times the corners of walls may not be perfectly square and adjustments then need to be made so that the ends of the timber structure are at least parallel to the adjacent wall even if it means the structure itself isn’t square. Small adjustment can be made to the gaps between boards to compensate for this. 1mm on each end of a gap won’t be visible to the naked eye but will result in a 20mm “gain”, after 20 boards, on one side. 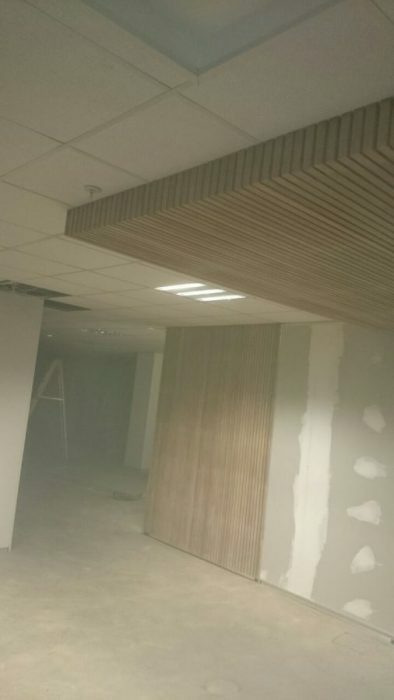 The ends of this suspended balau ceiling or bulk head needed to tie up with the boards to give it an appearance of being one solid, much wider piece of timber. It is often not possible to use a full-sized timber as it becomes too heavy on the structure, and the pocket. In these instances “build ups” are used to make it look like one solid wider piece of timber. The same principle is common in table tops where the top is only 22mm thick but is built up on the edges to give it the appearance of being 40mm thick. Care must be taken to do it neatly and it must be planned properly so that each piece fits into each other. There’s nothing more frustrating than getting to the end only to find you are 20mm out and should have set your first piece 20mm closer in. Screw holes were filled with a clear epoxy mixed with saw dust and sanded flat. 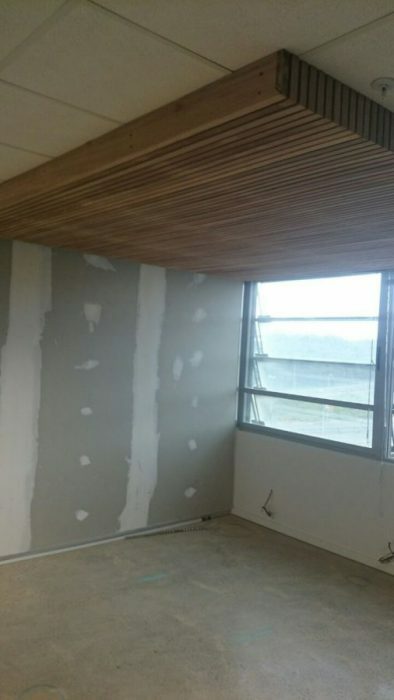 This balau ceiling was left un-oiled to give it as much of a natural appearance as possible. It can be finished with an oil and the only product to use here is either Timberlife Satin Wood 28 Base or Woodoc Deck Dressing. This oil soaks into the timber. Most other products will dry on the surface and will eventually peel and flake. 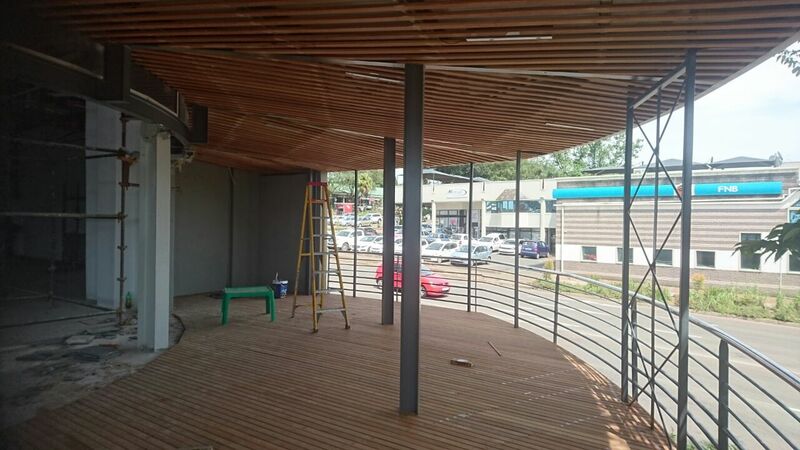 For a quote on all of your balau timber works, decks, balustrades, walkways and stairs please use the contact form us below or contact us on 031 – 762 1795. 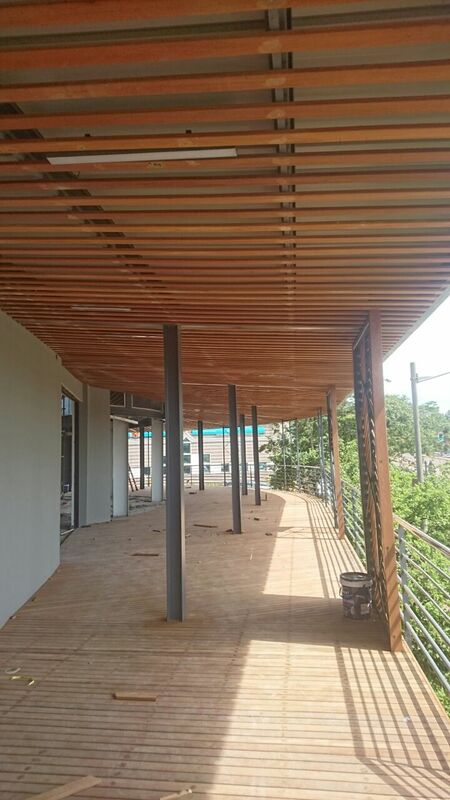 If you prefer to build your own we supply the timber and other materials required through our sister company Ocean Timber Products (www.oceantimber.co.za). You can leave an enquiry there or on this page. 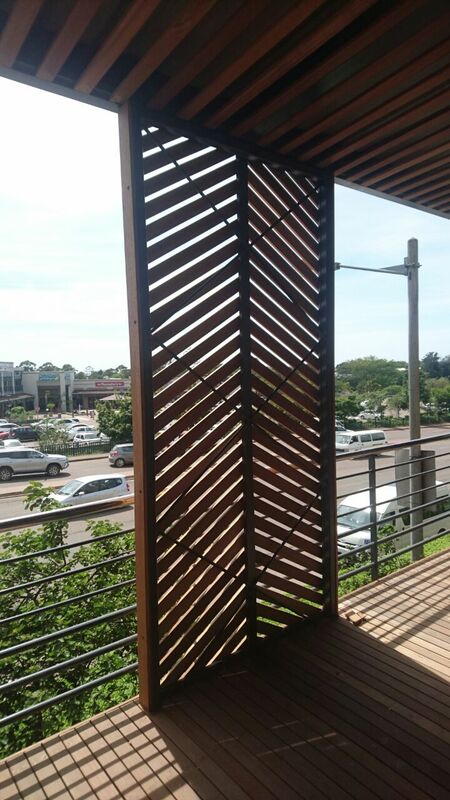 These balau timber stairs that we built in Umhlanga are actually temporary stairs which will be removed at some point. They were built in order to gain access up the bank to a converted container that has been placed at the top. It is for a new development at Umhlanga Ridge and the converted container will be used as a sales office to sell the units. Their life span will depend on how long it takes to sell all the units after which the container and stairs will be removed. We nevertheless used balau as we needed to create a very upmarket feel as this development is targeted at the high-end market. Initially we were going to build a platform or landing at the bottom, one at the top and one mid way to break the stairs into two flights. However the total distance did not require that and we settled for a landing at the top and one at the bottom. Normally if the flight of stairs is quite long one needs to split them into two flights with a landing mid way. This is to be compliant with National Building Regulations. It is stipulated for safety reasons because a very long flight of stairs becomes dangerous if not split into two flights. It is a bit more difficult to build two flights with a landing mid way because one needs to first build your top and bottom landings and then work out exactly at what height the middle landing needs to be. This is so that the two flights can be of equal distance and the risers of the first flight can be equal to the risers of the second flight. If the middle landing is not placed exactly in the middle of the total height, the risers of one flight will need to be different to that of the other flight in order to close the gap between landings. It can also result in a different number of risers. We used balau stingers, cleats and treads. We left the risers open and installed a balustrade down both sides of the stairs for obvious reasons. The balustrade was also full balau and installed in a vertical picket style with a 102mm capping on top. The stairs were 1m wide which allows for two people to occasionally walk up and down at the same time. I say occasionally because if it was a busy stair case and people were walking both up and down at the same time regularly then one would need to make the stairs 1.5m wide with a balustrade down both sides. There are other building regulations that stipulate when a hand rail is needed in the middle of the stairs case once it reaches a certain width. For a free no obligation quote on wooden stairs, decks, balustrades and other outdoor timber construction please call us on 031 – 762 1795 or use the contact us form below. Many years ago, as late as 1625, most European houses did not have a wooden floor. Instead they had a beaten earth floor which of course created problems with water and dust, as you can imagine. Wooden floors were reserved for wealthier people and in those days consisted of joists with planks of elm or oak up to 600mm wide. During the baroque era of 1625 – 1714, wooden floors became more elegant and included French parquetry and marquetry patterns which were made from hand cut pieces of hardwood laid in patterns of differing colours. They were then hand scraped, scrubbed with sand and polished. These of course were also reserved for the elite in society. During 1607 – 1780 the North Americans started installing wooden floors due to an abundance of wood. These floors were generally not polished. By the early 19th century, tongue and groove methods started to be applied by the wealthier clients but the random width plank system, face nailed to the joists, remained more common in modest homes. It was also during these times, due to the advent of tongue and groove, that floors could be sanded and levelled and sealed using shellac. Shellac was all that was really available to carpenters to seal wood in those days. It is derived from insect secretions and after being scraped from the bark of trees and processed, exists in solid form. When mixed with alcohol, it becomes liquid and can be applied. It dries very quickly. As there were no modern tools to perform these tasks it was very labour intensive and only the elite could afford this new technology. 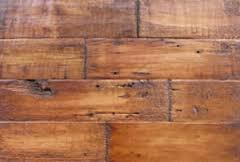 The American Victorian Era of 1840 – 1910 saw mass production of wooden floors and consisted largely of “wood carpeting” which were roughly 35mm x 7mm strips glued to a heavy cotton backing made of canvas. They came in rolls of about 1m wide and were installed by tacking down each board every 300mm or so. Nails were set below the surface and filled, sanded by hand and varnished largely with slow curing tung oils from China. This was not that durable in itself so floors were hot waxed and buffed to a shine with a floor brush. All by hand. I know what a job it can be to level a floor using tongue a groove boards with a large grinder or floor sander. I can only imagine the sweat and tears that went into producing a top quality floor in those days. 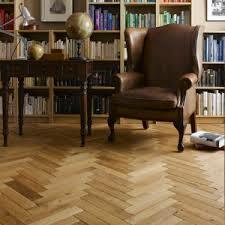 By the Edwardian era (1901 – 1914) tongue and groove flooring was the popular choice for domestic flooring. By the 1920’s and 1930’s wooden flooring was in competition with linoleum and cork floors which offered less maintenance. With the addition of alkyd resin, curing time and durability of finishes improved and emphasis was placed on hard solid durable floors. In the 30’s polyurethane was the choice for a no wax finish for floors which allowed wood to play a prominent role through the modern era of the 20’s to the 50’s. Wall to wall carpeting was still terribly expensive and a lot more expensive than wood. With the housing boom at the end of World War II, came doom for the wooden flooring industry. Because the broadloom (wide and long carpets) cost could be included in the loan for veterans, solid wood floors were very quickly covered up with more expensive, and therefore more sought after, wall to wall carpets. So from the 50’s to about the 80’s hardwood flooring companies struggled to survive and had to adapt my installing carpets. Also ply wood was commonly used then below the carpets. As a result of this the labour paid to install floors decreased and of course the quality dropped as labour struggled to lay more flooring in a day just to survive. This resulted in poor quality floors being laid which made them unpopular. Parquet was then branded as cheap and common. As we move along in time, and wooden flooring becomes more expensive than other types of flooring, because wood itself is becoming scarce, solid hardwood flooring starts, to my joy, becoming more popular and associated with the more elite end of society. Carpets are being ripped up to find Swiss parquet and parquet blocks, largely of teak which are being restored to their former beauty. 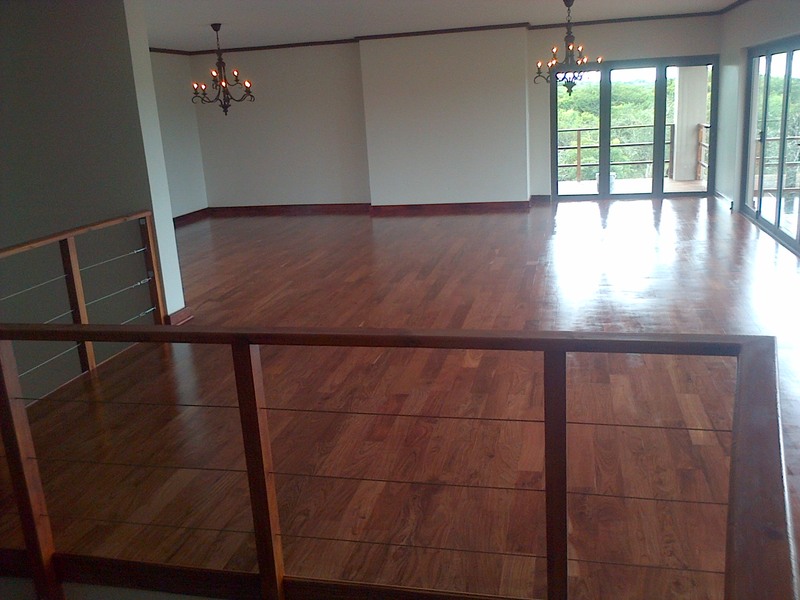 A lot of new floors are being laid in solid hardwood too and are preferred over carpets or tiles. Tiles and carpets have had their day. Solid hardwood reigns, for now, but watch this space because the wheel turns and in a few decades I suppose wooden floors will lose their popularity as do all things with time. For a quote on your solid hardwood flooring needs please contact us on 031 – 762 1795 or use the contact us form on this page. 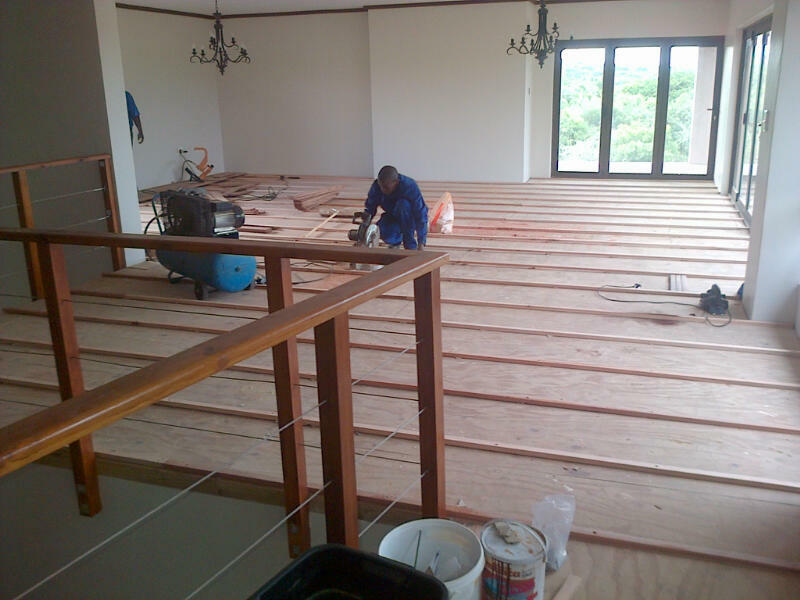 These solid wood floors were installed in Hluhluwe in a house that was being renovated by the new owner on a farm. 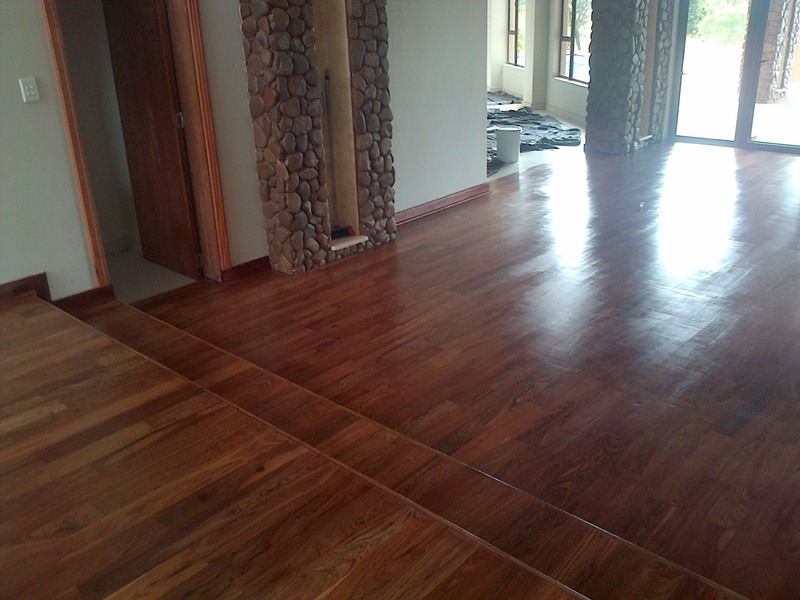 We used all brown teak, end matched. Most of our teak in South Africa comes from Zimbabwe and they are not allowing teak to leave the country without being machined there. So they were machined in Zim, exported to Gauteng and then shipped to Durban and then up to Hluhluwe. We always allow our timber to stand on site for at least two weeks to acclimatise to the humidity and conditions in their final resting place. 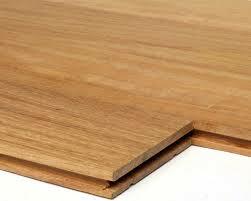 This eliminates problems further down the line of boards swelling after installation which cause popping of boards. Because it is quite difficult to get long lengths of teak, these boards were end matched. They varied in length from 450mm to 1m. To avoid waste in installation the manufacturer will machine them with tongue and groove joints on all four sides so that instead of cutting the ends off to line them up with a bearer, you can simply install them end to end between two bearers because they are tongue and grooved on all four sides. The amount of waste that would be created if they were to be cut would amount to almost half of the total floor area. With lengths of 3m plus, this is not necessary as the waste is far less as a percentage of the total wood being used. We had two areas to floor, upstairs and downstairs. Upstairs there was a mezzanine type floor that had been installed already with wood joists and shutter ply. We installed bearers on top of this and then nailed our floor boards on to them. Downstairs was a concrete substrate which we fixed bearers to using hiltis. It is vitally important to get this substructure of bearers completely flat and level. So spend a bit of time on getting this right as the rest of the job will run smoothly if this is done correctly. The easiest way is to install one bearer on one end of the room and another on the other end of the room with both being level in both directions and to each other. Then run fish line between the two in intervals of about 500mm. Now you can set all your other bearers flat and level to these two, the result being a completely flat and level substructure. Once the bearers are down you can start installing the boards from one end of the room. 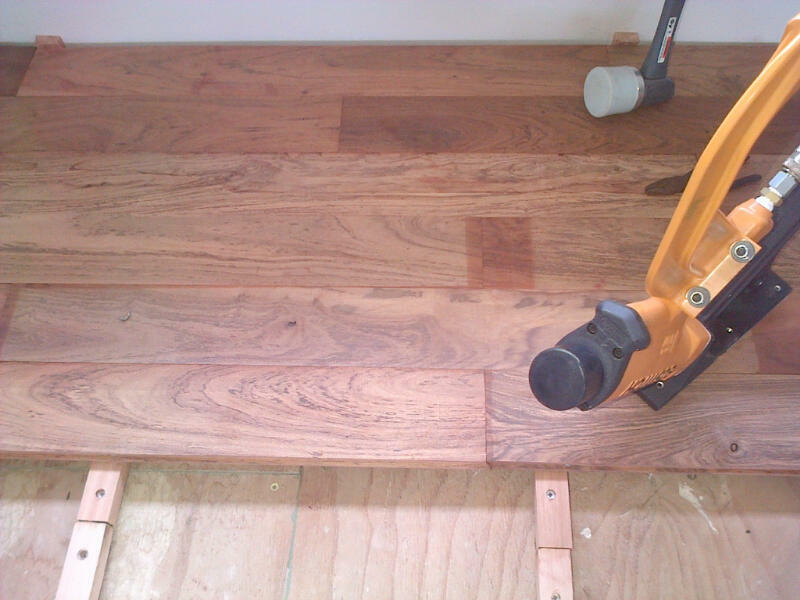 We used a specialised hardwood floor nailer, which I have written about here. Because this machine, or tool, is designed at a 45° angle, it cannot be used for the first or last floor boards. On the first one you must use a 40mm oval nail through the tongue (pre drill the pilot hole in hardwoods such as teak) and counter sink it is so it is invisible. From here you can use the hardwood floor nailer. The last board, or last few boards, will also not be able to be installed using this tool as the wall will get in the way. You also can’t successfully nail by hand as you did on the first board, so you will need to face nail the board. That is to drive a nail through the face of the board into the bearer and then neatly close the hole with a suitable filler to match you wood colour. The next step is to sand the floor flat. Even though these hardwood floor boards are machined precisely to fit snugly into each other through the tongue and groove joint, they do sometimes vary in thickness by a quarter mm and this needs to be sanded flat using a floor sander and 40 grit paper. Teak is extremely hard so this part was slow going. Once it is flat you can then use a 100 grit paper to get rid of scratch marks left by the 40 grit and get the wood to a smooth finish ready for sealing. Vacuum ALL the dust up and vacuum again to make sure that ALL dust is off the floor prior to sealing. We also use a flat broom. The same broom you see them using in shopping centres. This broom moves dust around in one steady motion rather than the normal sweep motion that causes the dust to become airborne and settle again where you have just swept. From time to time you need to vacuum the broom to get rid of the dust and continue sweeping. 3 Coats of a good quality polyurethane sealer is required. Sand lightly with a 200 grit paper to remove any hairs or fibres that would have been raised after the first coat. If using a water based sealer you can dilute the first coat with water so that it penetrates the timber. There are many sealers that can be used. We prefer the water based ones as they dry quicker than the others and are friendlier in their behaviour. 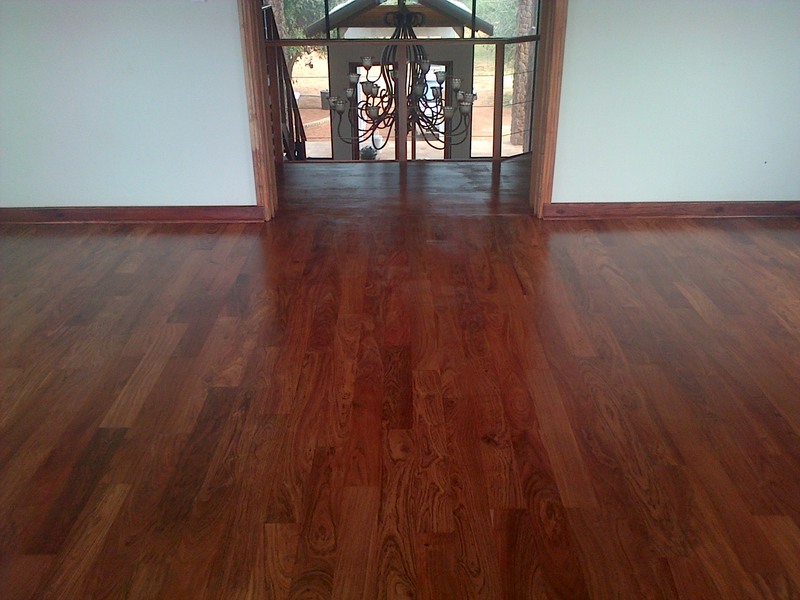 For a free no obligation quote on installing or just sanding and sealing your solid wood floors, please contact us on 031 – 762 1795 or you can use the contact us form below.